Two minuscule 2,600-year-old inscriptions recently uncovered in the City of David’s Givati Parking Lot excavation are vastly enlarging the understanding of ancient Jerusalem in the late 8th century BCE. The two inscriptions, in paleo-Hebrew writing, were found separately in a large First Temple structure within the span of a few weeks by long-term team members Ayyala Rodan and Sveta Pnik. One is a bluish agate stone seal “(belonging) to Ikkar son of Matanyahu” (LeIkkar Ben Matanyahu). The other is a clay seal impression, “(belonging) to Nathan-Melech, Servant of the King” (LeNathan-Melech Eved HaMelech). Nathan-Melech is named in 2 Kings as an official in the court of King Josiah. This burnt clay impression is the first archaeological evidence of the biblical name Nathan-Melech. According to Shalev, while both discoveries are of immense scholarly value as inscriptions, their primary value is their archaeological context. “What is importance is not just that they were found in Jerusalem, but [that they were found] inside their true archaeological context,” Shalev told The Times of Israel. Many other seals and seal impressions have been sold on the antiquities market without any thought to provenance. This in situ find, said Shalev, serves to “connect between the artifact and the actual physical era it was found in” — a large, two-story First Temple structure that dig archaeologists have pegged as an administrative center. “It is not a coincidence that the seal and the seal impression are found here,” said Shalev. According to archaeologist Prof. Yuval Gadot of Tel Aviv University, in the 8th century BCE, this area of the City of David becomes the central administrative center of Jerusalem. The newly unearthed two-story public building, constructed with finely cut ashlar stones shows, illustrates the beginning of a westward move of the administration area in the large sprawling city. Mendel-Geberovich believes “Ikkar” refers to a personal name rather than an occupation. If so, this would be the first evidence of such a name. 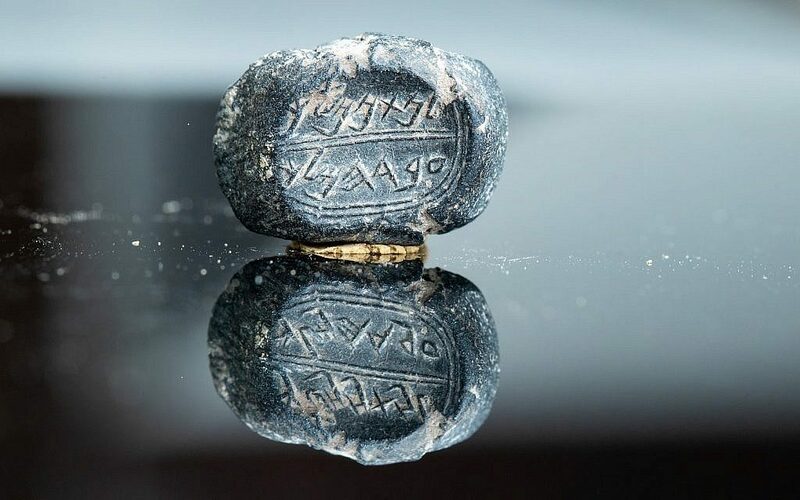 The other portions of the inscription are more familiar to biblical Hebrew linguists: “The name Matanyahu appears both in the Bible and on additional stamps and bullae already unearthed,” said Mendel-Geberovich. What is most likely to capture popular interest is the burnt clay seal impression, which features the words: “(belonging) to Nathan-Melech, Servant of the King” (LeNathan-Melech Eved HaMelech).” The fact that it was written without a surname indicates his fame is on par with celebs of today, such as singers Madonna or Adele. While the biblical account uses a different title than that impressed on the ancient clay, the title “Servant of the King” (Eved HaMelech) does often appear in the Bible to describe a high-ranking official close to the king. According to the IAA, the title appears on other stamps and seal impressions that were found in the past. In ancient times, seal impressions, or bullae, were small pieces of clay impressed by personal seals (such as the “Ikkar” seal) to sign letters. But is this the very same biblical Nathan-Melech? That’s still a matter of interpretation. However, scholar Mendel-Geberovich isn’t as quick to confirm the tie. “Although it is not possible to determine with complete certainty that the Nathan-Melech who is mentioned in the Bible was in fact the owner of the stamp, it is impossible to ignore some of the details that link them together,” said Mendel-Geberovich diplomatically.